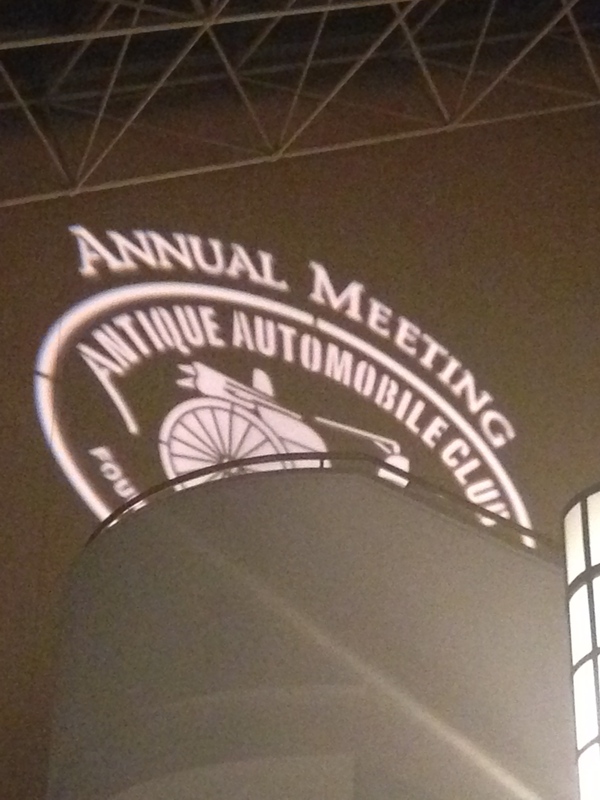 The Antique Auto Club of America’s Annual Meeting began this Friday morning in Philadelphia, PA. This is the first annual meeting of theirs that I’ve attended – the main AACA event that we’ve been to is the annual (and magnificent) Hershey national meet in the fall. There’s not a lot of content specific to eighties cars, but there is a lot of content that is relevant (all 1980s cars are now eligible for AACA judging). AACA logo projected on a wall at the host hotel. I’ve already attended a bunch of seminars, including ones on how to prepare effectively for an extended road tour, General Motors literature, the complete story of MG, and the AACA library‘s multimedia resources (including a 20 minute advertising video from 1984). My wife and I skew young among the hundred of attendees here, but all of us here share a love of old cars and everybody has been really nice. We’re “auditioning” this event and we’ll see if we do it again.